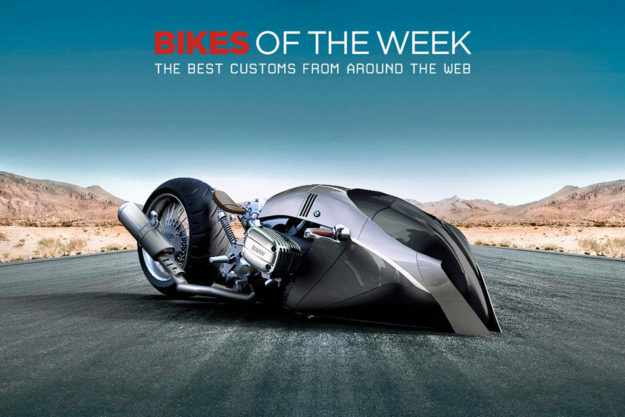 A stunning new concept from the designer of the BMW Alpha Landspeeder, a gorgeous Hodaka Ace restomod, a 200 hp turbocharged Indian Scout from Sweden, and a Yamaha SR400 homage to the fashion designer Emilio Pucci. How’s that for variety? 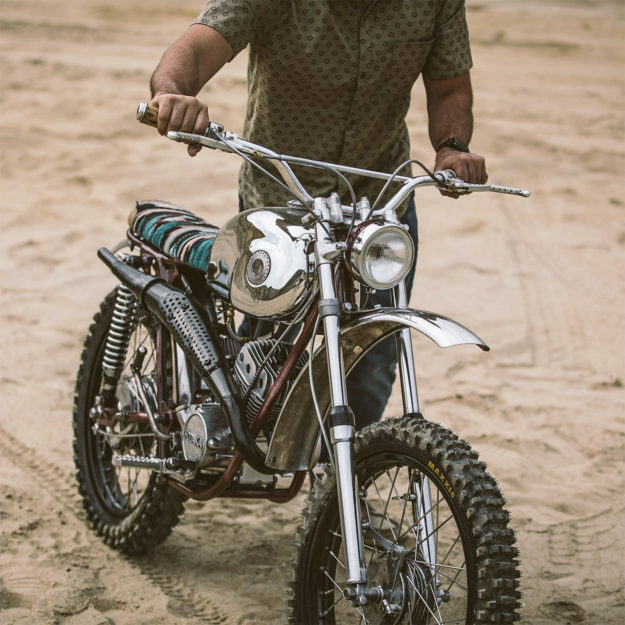 Hodaka Ace ‘Navajo’daka’ When Chris Tope found a $20 chrome gas tank at a swap meet, he thought it would make a cool desk lamp project. After researching its origin, that plan was scrapped and a full Hodaka build began. Eight months and ten days later, the Navajo’daka rolled out of the toy hauler he uses as a workshop—and jaws began to drop. With only the tank to start with, Tope scoured eBay and managed to score a Hodaka Ace for another half-dozen Andrew Jacksons. The old Ace was complete, but it needed a lot of work. The frame received a 3-inch stretch and the welds were bolstered for added strength. Replacement parts were tough to source, but persistence and patience paid off. 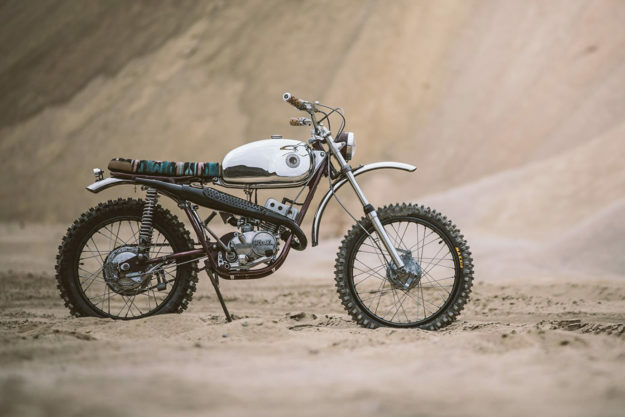 The engine in Navajo’daka has been punched up to 125 cubic centimeters of two-stroke fury, and it now breathes through a 28mm Mikuni carb. But it’s the design details that really steal the show here. The Navajo theme stemmed from sketches Tope had made in a notebook, and he went to great lengths to ensure they were executed expertly. 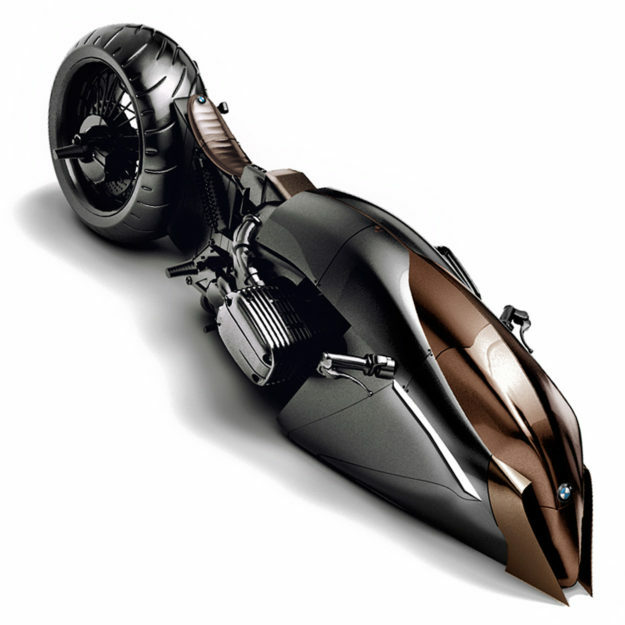 Mehmet Doruk Erdem’s ‘Khan’ BMW motorcycle concept If the name Mehmet Doruk Erdem doesn’t ring a bell, it should. His design was the one that guided the hands on the achingly gorgeous Alpha we featured last year. This time around, Mehmet has changed his gaze from the past directly into the future. The dustbin fairing has some otherworldly levels of aggression that both the Romulans and Denis Villeneuve would adore and, admittedly, so do I. 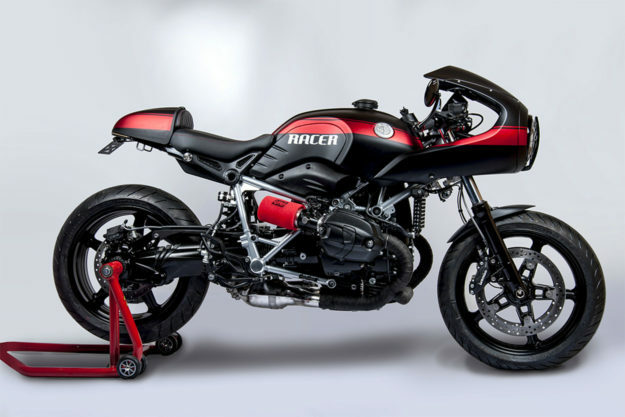 Based around the boxer found in the R1100R, Khan may fall a few MPH shy of warp speed but its stance sitting still is slippery quick. Turbocharged Indian Scout by Fullhouse Garage Shop Mixing modern technology with classic lines is nothing new to the custom world. Hell, the whole scene basically runs on that kind of thinking. And while there are plenty of builders doing it well, there’s only a handful that marry those elements impeccably. With their latest build, Stockholm-based Fullhouse Garage joins the elite. 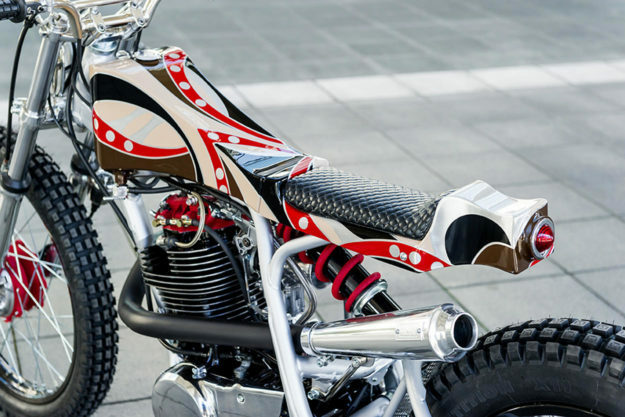 Created to pay tribute to Indian’s original engine builder, Oscar Hedström, Anders Lundgren and Lasse Sundberg combined their talents to deliver this blown Indian Scout. But there’s much more going on here than a little turbocharged hot-roddery. The Super Scout’s frame is completely bespoke and was crafted out of three separate components. The tank is a one-off unit, with the actual fuel cell now residing under the saddle—so some of the intricate plumbing on the Garret T25, as well as the throttle bodies, electrics and master cylinder, could hide. The fueling is programmable, as is the boost control. And there’s a Bluetooth ignition system to transmit tuning data wirelessly, as well as adding spark to the 1133cc Indian V-Twin. Up front, the Super Scout rides on a W&W Indian leaf spring suspension and a Beringer inboard brake hugs the hub of the 23-inch hoop. 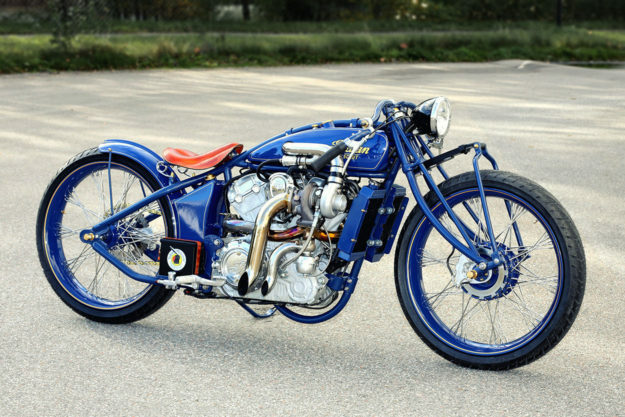 The rear is a hardtail set-up, with a matched, cross radial laced wheel and a billet sprocket brake by Harrison that completes the 1920s boardtracker aesthetic. 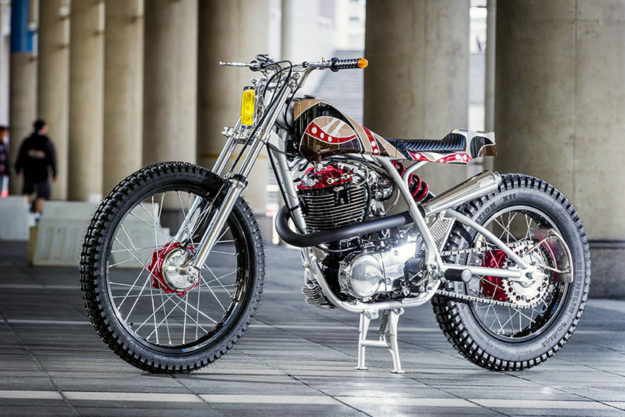 Yamaha SR400 by Candy Motorcycle Laboratory Combining a mix of tracker, scrambler and motocross styles, the two-man team from Japan has delivered a braptastic take on the Yamaha SR400. Named ‘Pucci’ as a tip-o-the-hat to the champion of colors, fashion designer Emilio Pucci, the bike’s stance and style is rivaled only by its extensive palette. To nail the slender silhouette they were aiming for, Candy MC Lab handmade all of the bodywork and a new stunted subframe was grafted on. The tank, seat, rear cowl, exhaust and even the handlebars are all one-off, bespoke units. To scrounge a little more oomph from the 399cc thumper (and not waste the work on that exhaust), the carb from its bigger brother, the SR500 was fitted. 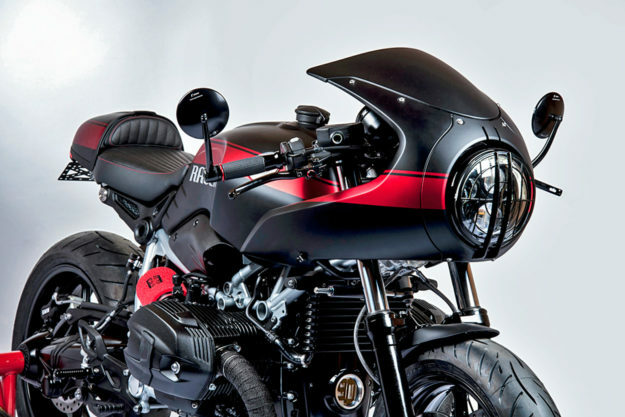 Custom BMW R nineT Racer by Tank Machine Built in collaboration with BMW Motorrad France, ‘Redline’ is a dark and sinister approach to the R nineT Racer by aftermarket experts Tank Machine. 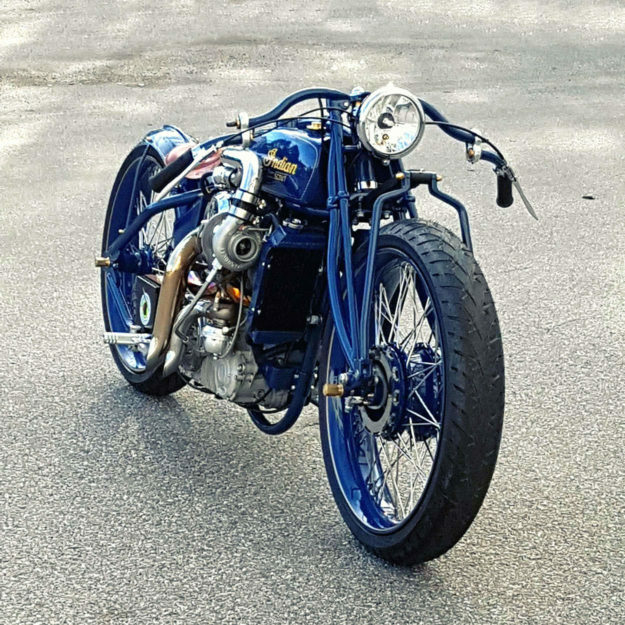 With only a month to finish the bike, many of the parts and pieces can installed by us average Joes—but there’s still plenty of custom work to admire. The front fairing has been trimmed to slim down the stock nose, and in the process, builder Clement has neatly integrated a set of Motogadget Pin indicators. The roundels that typically adorn any Beemer have been swapped for a milled set, and the blood-red-on-black paint scheme looks spot on—although I’d have opted out of the ‘Racer’ graphics. 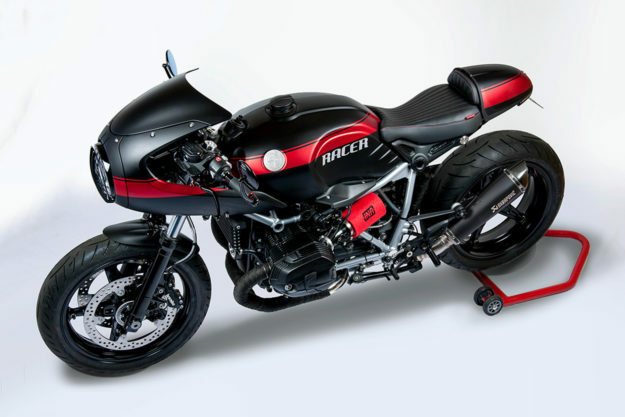 An Akrapovič exhaust has been fitted up, and the boxer now breathes freely through color-matched, Uni pod filters.